Thank you, everyone. The Lion King was a “roaring” success. It’s all about the kids. We say that over and over again, but this time it really was all about them because so many came out to help put the show together. However, so as to not let anyone feel unappreciated, here’s a list of all who helped. Thank you again. Our school musical this year is The Lion King! Performance dates are January 26 and 27 at 7 p.m. and January 28 at 2 p.m. Tickets are $12 for adults and $10 for kids fourteen years and younger. 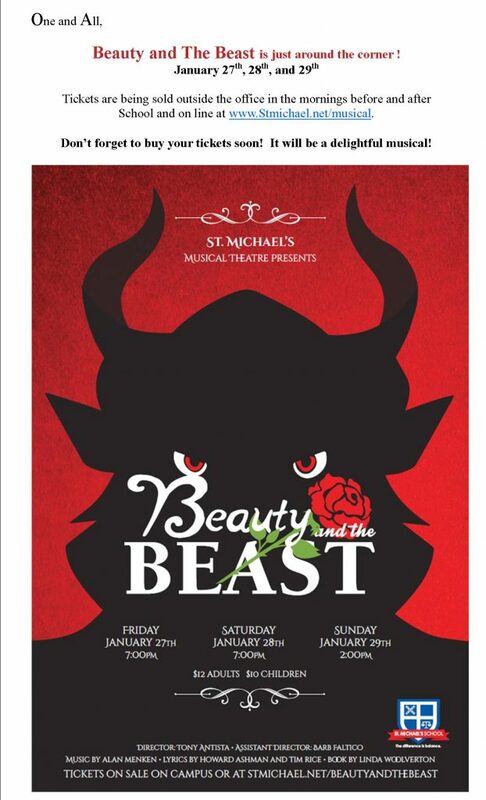 Please get your tickets online at www.stmichael.net/musical or buy tickets at the ticket table set up in front of the Music Room before and after school. You can use cash, credit card, or check. Spread the word! It is one of the best ways to bring guests to our beautiful campus and enjoy our talented kids. We will be having auditions for this year’s school musical, The Lion King, on September 5, from 3:30 to 6:00 p.m. This is for students in grades 3-8 only. The rehearsals will begin on September 11, and they will be held on Monday and Tuesday afternoons from 3:30 to 5:30 p.m. Please sign up on my classroom door. Thanks. 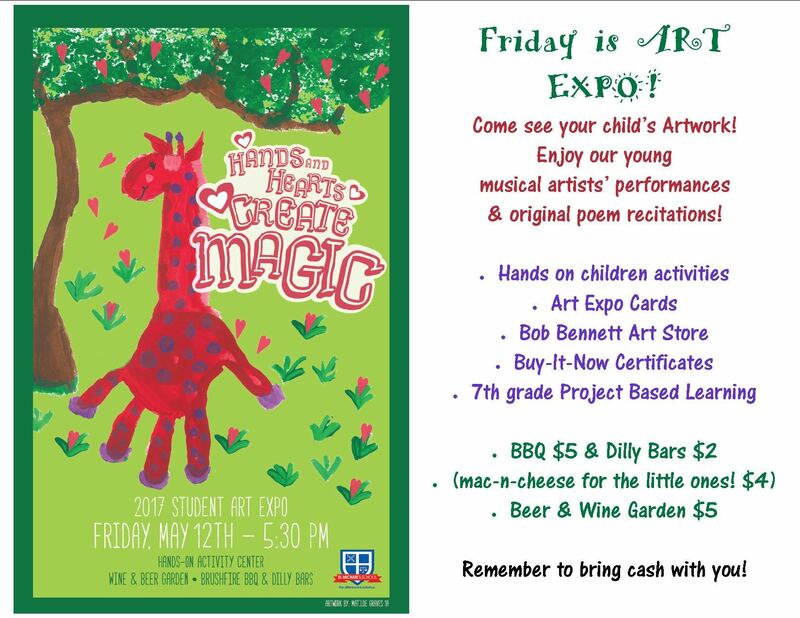 We are getting very close to our Fine Arts Night show on May 19th at the Temple of Music and Art. There are many things that happen between now and then, so I’d like to have you put a couple of things on your radar for that day. The dress rehearsal is during the school day on the 19th. We will take the kids from St. Michael’s on buses in the morning to rehearse on the stage. The rehearsal is from 9:30 a.m. until 3:30 p.m. Students will need to pack a lunch and snacks for the day to bring to the theater. We take them to the theater, but you must pick them up at 3:30. The address of the theater is 330 S. Scott Ave., Tucson, AZ 85701. Order forms for the 4-8 Fine Arts Night Flowers went home last week in the Eagle Express. Additional forms are also available online via the school blog and middle school PlusPortals, or in the School Office. They are due back by Wednesday, May 17. Pre-ordered flowers will be available for pick-up at the Flower Stand from 6:00 – 7:00 p.m. on the night of the performance. A limited number of bouquets will be available for purchase the night of the show, so order early to guarantee yours!